Has Samsung definitively fixed the battery issue that haunted them last year? Last fall, we heard almost every day about a battery inside of a Samsung Galaxy Note 7 exploding or catching on fire. This resulted in the eventual recall of the phablet, and Samsung's name was dragged through the mud. In order to make sure that this would not happen again, the company commissioned a thorough investigation of the incidents involving the phablet. Among the changes made is the addition of an 8-step test that every battery goes through just to confirm that there is nothing wrong with the power source. The good news for Samsung is that in the first fifty days following the launch of the Samsung Galaxy S8 and Samsung Galaxy S8+, there have been no issues with the battery. Ironically, the refurbished Samsung Galaxy Note 7 will soon be available, powered with a smaller cell. This was a good move on Sammy's part because had the Galaxy Note 7 not suffered from the battery issues, it might have gone on to become the most popular Samsung Galaxy handset of all time. The Samsung Galaxy Note 8 will be unveiled just before IFA kicks off in Berlin this year, starting on September 1st. After last year's stumble, all eyes will be on the high-end phablet to make sure that Samsung has made the necessary corrections. Judging from the safe track record of the Galaxy S8 and Galaxy S8+, the batteries on this year's phablet will not be an issue. I never really doubted Samsung from the very beginning. @Xednyl: Of course not, a company as big as Samsung can't afford not to learn from their mistakes or else they would lose the trust of customers world wide. From a literal standpoint, Samsung can afford the best of the best and should have never had an issue with the N7 to begin with. Last years best (sans battery), is back. S8, S8 Plus, Note 7, and soon, the Note 8. Damn Samsung...do that sh*t.
Definitely won't be an issue once everyone switches over to a much more stable and safe technology. Those much more safer battery techs have been showcased years ago, yet they still do not make it pass the prototype stage. And I'm sure there's a very underhanded political reason for that. None of the Galaxies before the Note 7had this issue. So tbey already had a safe record. They gave have sold more phone than any OEM including Nokia, and tbis has only happened once. The idiots whp made a big deal out of 60 phones vs 4M were crazy. Yet their phone has a 62% failure rate from unknown problems. At lease this problem was handled. At least we didnt vet blamed. At leasr we are gonna get an even better phone. Apple comes and makes pretty much the same phone the following year wirh no backlash. PA was tryimg their to report ecery incident. Even claiming incidents tbat didnt even involve the Note 7. If I could get one now I would. But the US likely wont lift the ban. PA do we really need another article on this matter? Man the click bait and flame wars. Can we leave this issue alone I mean really how many articles were there on antenna gate or Bend gate ? or ID53 errors we know that every manufacture has made mistakes can we move pass this one now. Only in retarded and exaggerated minds of crap media made it worst. There is not even a handful of random reports and yet Samsung generously recalled all their Note 7 phones. "Only in retarded and exaggerated minds of crap media made it worst." Are you seriously blaming the media for Samsung's f**kup? The hoops some of you jump through remind me of drug addicts rationalizing why they stole their kid's Christmas money to buy Meth. Its pathetic. Tragic... yet still very, very pathetic. "There is not even a handful of random reports and yet Samsung generously recalled all their Note 7 phones." A) I'd HIGHLY suggest you look at the number of digits you have on your hand. I'm pretty sure there are only five for the majority of us. Unless your a special case (snowflake) with like 12. B) Generously is a total exaggeration. The first recall happened about 2 weeks too late IMO. If they had addressed it earlier on in the product's life cycle, they could have salvaged something other than parts. Instead, they waited too long, released it too early afterwards, and the rest is history. Response to #7 BTW. PA, fix your comments section. Jesus Christ, you can't even read the comments anymore. They're all out of order. instead of fixing it, they made it worse. Too late? Galaxy S8 and S8+ are Samsung's fastest selling flagships to date...so clearly it isn't "too late". Gonna be hilarious when Note8 sells millions in record time. We'll be sure to mock you even more from then on. The sales numbers won't burn his rump nearly as much as the reviews crowning it the best large phone available. What are you smoking? If Samsung didn't learn, then when did they implement a 8 point check system for batteries? I don't hear about any other company doing this this. What exactly do you mean by replacing the batteries in these newer phones? Are you referring to the Note 7 or the S8? The replacement batteries after the first recall were made by ATL, the same company Apple uses for their batteries but the inside of the Note was too compact that the battery had no room to expand. And what does the curved screen and 3D TV have to do with anything? If it was such a gimmick, the S6 Edge and S7 Edge wouldn't have sold 2-1 over the flat screen and other companies wouldn't be following to add the same design to their phones. As for the TVs, 3D was a big thing a few years ago and Samsung tried something to capitalize on its early success, then they realized that was dying and stopped with 3D TVs real quick. Like it or not, there is a high demand for curved TVs to the point that LG and Sony joined in. There's even curved computer monitors. Maybe you wouldn't be so upset if you'd accept the fact that different companies, not just Samsung, are trying new things and having success with it. Just because something doesn't work for you doesn't mean you have to have to be a Debbie Downer and label everything a gimmick. Embrace the future. He's not smoking anything, that's just his severely burned bum. It's due to Samsung phones being ranked the best every year. 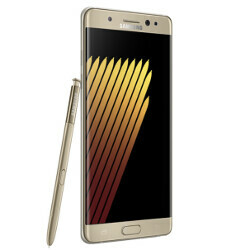 "the refurbished Samsung Galaxy Note 7 will soon be available, powered with a smaller cell. "...Report on this instead !!! It's dead obvious Samsung isn't going to repeat the same mistake! If people would give up on the concept of a "slim stylish fashionable" crap idea of a phone and go back to making them a little thicker, this would never have been an issue. Thin phones BEND. Bend a LiOn battery enough and it will pinch. Pinch one and BOOM! The reason why you don't see removable batteries anymore is partly because of the THIN design of phones. That HARD PLASTIC case around those batteries takes up space. Space that could be used to stuff a larger battery inside the case, to run the OVERPOWERED and OVER BRIGHT/pixel density screens. Go back to a THICKER design with a removable battery and this problem goes away. Most of these phones you see with the "water proof" certification are for two things. One, to make sure water doesn't damage the insides, and two, more important, to make sure NO moisture doesn't get inside the battery. Ever wonder why every watch that has a battery has "water resistant" stamped on them? Because they have a lithium battery inside. Crack one of those CR2032 batteries and sprinkle a couple drops of water on one and wait a little while. Hey PA was this article really needed? Why don't you write another one about Apple's fantastic new file manager? The article was needed. You know there have been PA writers and commenters doing Google searches night and day to find an exploding S8. I'm surprised they haven't put out a reward for the first person to find one. It's only been 50 days, they're not giving up hope. I haven't seen one case of a S8 catching on fire. PA just copied her sister in articles like this. I believe you know who that is. BGR!! Well:) Guys, not so fast. Just wait. LOL GS8/8+ , are not the real threat for Apple and the US media. (even if best on the market now) The real treat is the Note line. This is the category that no one OEM can make device to compete with. Don't even think that the US media(and WallStreet) will not find a new way to attack dirty, the Note line again!!!!!!!!!! China and Taiwan will help again:) Mark my words!